Pressure ridges with Castle Rock, Mt. Erebus, and the Kiwi's new helicopter in the background. Sea ice as of September 19, 2009. 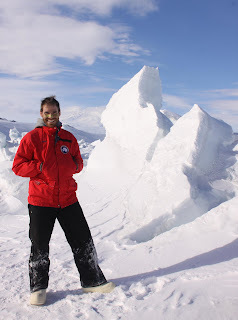 Pressure ridges form where an ice sheet breaks and the main piece continues to push up over the broken piece. I believe some pressure also comes from the winter sea ice not allowing the shelf to slide unimpeded. 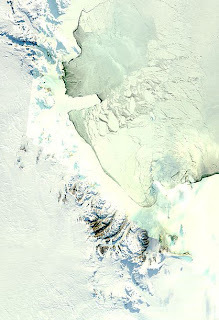 Each winter, the Ross Sea and McMurdo Sound fill up with ice (see the picture above). If the sea ice is out, the ice shelf can keep moving. If the sea ice is there, extra pressure can build. Similar to when tectonic plates push together to release pressure in the form of mountains, we get mini-mountains, or what we call pressure ridges. Our tour guide and one of my snowboarding partners in Colorado, Kish. Kish's favorite formation. I think he called it Fire Ice. I didn't plan to go to the pressure ridges this year. There are only so many tours available and I wanted to let others go who have not been out. However, my snowboarding and winterover friend, Kish, offered me a spot on his private tour. I was more than game for that. We went out on a beautiful, almost windless day. Michael and Meg joined us as well and, as always, were a source of joy and smiles. Kish was also a rock star of a guide. He treated it like a guide back home and was entertaining and educating the entire way. Such a treat. The Hand is going to grab you. One of the fun things to do while walking through the 2 hour tour is try to find shapes in the ridges. I think my favorite was the Hand reaching up out of the ground (picture above). The trick of the ridges is that they are very dynamic. Your favorite formation could actually be gone from one week to the next. Finding formations reminded me of the Breckenridge Snow Sculpture competition that I'm missing back home this year. Me with the strongest sun screen EVER on my face. pretty! wow, it's amazing to see complete white surroundings. neat. random note: roff is completely against the olympics because of the divide of nations & such. so unlike a lot of people who are flocking to vancouver, he's leaving his centrally located residence to escape the madness. i dunno what to say to that...i feel bad for wanting to go to the olympics to see the athletes compete LIVE!